Sometimes when I get troubled a bit I bake. Baking helps me to take my mind off the troubles and be thankful and thoughtful for a little while. And easy bread like this doesn't take special ingredients (unless you don't keep pumpkin around) so it is fairly inexpensive to make. 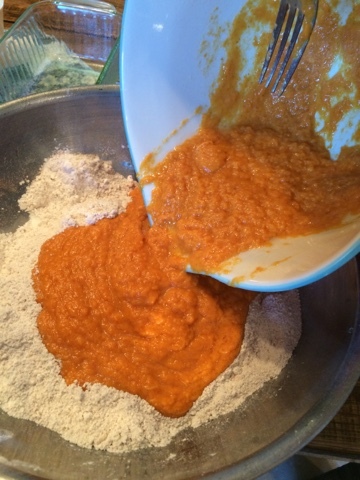 Mix the dry ingredients and then mix the wet and then mix together. Grease 3 loaf pans and pour the thick batter in about half full. I didn't add anything to these loaves, but I am thinking that adding raisins would be wonderful. My children insist I should have added chocolate chips. I did dust the tops with some cinnamon sugar mix. Bake at 350* for about an hour, it really depends on your oven. This recipe makes 3 loaves. While in the kitchen I spend a lot of time talking to the Lord. Most often while I am washing dishes. When I'm standing at my little sink, looking out the window above and washing I can usually spend a few minutes of relatively quite time just thanking Him for all His blessings and praising Him for who He is and praying for what's on my heart. With almost zero counter space, no dishwasher and a fairly big family there are a few times a day when I am at the kitchen sink and I tend to enjoy this time. And of course you know when you bake you tend to dirty a few more dishes... but in this case, it was very well worth the dishes and the time spent in prayer is always worth it! I needed this reminder of thankfulness more than the delicious bread recipe. I have made it twice and it never disappoints. My heart was convicted, though, by the gentle reminder to focus on what I have, instead of what I have not. 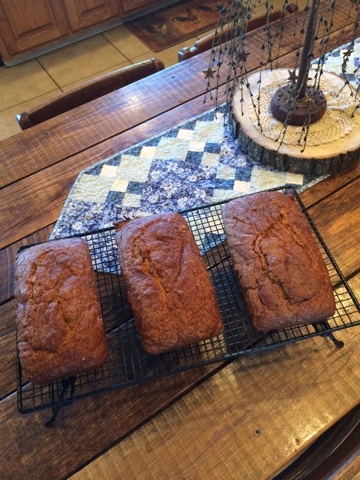 Thanks for sharing the recipe and the heart.